Today, technology is being used in all spheres of life and in all industries. 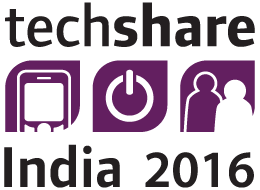 Techshare India 2016 witnessed some of the most eminent and expert speakers across the globe who shared their experiences on various topics including Software Applications, Mobile, Cloud Computing, Web, Kiosks, Wearable Technologies, Internet of Things, Smart Cities, 3D Printing, Gaming and Assistive Technology. We had 30 plus speakers lined up for the 2 day conference who provided an in-depth knowledge with presentations focusing and contributing to the theme ‘Towards Digital Inclusion’. We had speakers from Microsoft, Wipro, ATIA, Google, Accenture, PayPal, G3ict, TCS, DAISY Consortium, Ebay, Mobile Manufacturers Forum, EnAble India, Deque Software, Union Bank of India, Pune University, Saksham, Voice Vision, Dolphin Computer Access etc. Panel discussion on Public Procurement – A step towards implementing accessibility moderated by James Thurston, G3ICT, Prashant Shukla, Microsoft National Technology Officer, Shravanti Chaudhari, Wipro Practice Head, Applications Management Group, and Matt May, Adobe, Senior Program Manager.